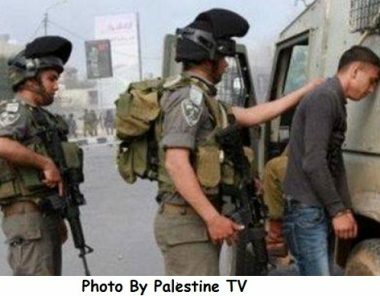 Israeli soldiers invaded, earlier on Friday, Yatta town and Hebron city, in the southern part of the occupied West Bank, searched many homes and kidnapped six Palestinians. The Hebron office of the Palestinian Prisoners Society (PPS) said the soldiers kidnapped Mohammad Yousef Makhamra, Ibrahim Mousa Makhamra, 34, and Ehab Abdul-Aziz Abu Hussein, from their homes in Yatta town, south of Hebron. The soldiers also kidnapped Ibrahim Makhamra, after searching his home and took its measurements, threatening to demolish it within 24 hours. Another Palestinian from Yatta was kidnapped from his work in Jerusalem. He has been identified as Mohyeddin Abu Fannar. Local sources said that dozens of soldiers surrounded the town before invading many of its neighborhoods, especially Roq’et al-Khalla, al-Heela, Khallet al-May and Reef, and violently searched many homes causing excessive damage. In addition, the soldiers invaded Beit ‘Amra area, in Yatta town, and kidnapped Ismael Ed’eis after violently searching his home. In Hebron city, the soldiers invaded the home of Ramadan al-Qawasmi, and kidnapped him, after searching his property. Al-Qawasmi is a student of the Al-Quds Open University. The army also invaded and searched homes in Sa’ir town, north of Hebron, and fired many flares and sound bombs. On Friday at dawn, the soldiers stormed and searched dozens of homes in the West Bank districts of Qalqilia, Ramallah, Jerusalem Bethlehem, and Tubas, and kidnapped six Palestinians, including one woman.